Today I set out to visit three Buddhist temples in Siem Riep, Cambodia. I have to admit what I experienced exceeded way beyond my expectations. Here’s the story. Wat Damnak was the first temple I sought out for. Right after I made a snap chat about not knowing where I was going to go I bumped into a monk named WuThy. He told me that he was on his way to school so I asked him if I could join him. His response was a humble “Ok”. After asking I sort of didn't realize what I was getting myself into, I felt uncomfortable at first but it triggered a memory of something I read earlier today "Fear, uncertainty, and discomfort are your compasses toward growth". As we walked for about a mile out to another temple called “Wat Bo” where WuThy did his schooling. When I arrived a lot of the other monks would look with curiosity. After waving to them and smiling they’d smile back which made me feel comfortable being there. In my last post I was saying to you all to do something that makes you feel uncomfortable. 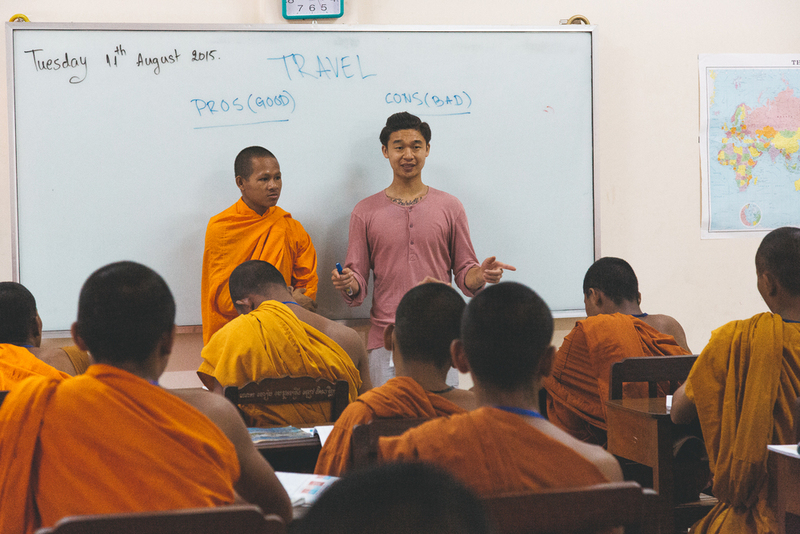 Today i’m happy to tell you that I spoke in front of 30 monks about western culture, traveling, and inspirational tips. They all welcomed me and asked me about my life. I told them about my up bringing and how I got to where I am today. I was happy to connect some of my personal beliefs with the teachings of Buddhism. The teacher Kosol did a great job at connecting what I had to say with virtue. I said to the class that I would’ve never imagined that I would be there speaking to them 5 years ago, and that anything is possible if you further your education. I left them with one of my favorite quotes on the white board “Dream as if you’ll live forever, live as if you’ll die today"